If you're one of my faithful readers, you know by now that my Mom was truly an amazing woman. As I become older, I realize more and more just how amazing she was. She could make a pot of chicken stew big enough to feed an army by using only one small chicken, she could make gallons of gravy with barely any drippings from a single roast beef, and she could stretch a ham into several meals. She used to tell me that ham is great because you can serve it at any meal. Ham and eggs for breakfast, ham and cheese sandwiches for lunch, and Hot Ham for dinner. Now, I know you may be wondering "What's hot ham?" Right? Well, it's sort of the ham version of a hot roast beef sandwich. (You know, thin slices of roast beef in brown gravy served on fresh round bakery rolls). But with hot ham, it's more of a thin glaze rather than a gravy. At first, I couldn't remember how Mom used to make it. All I could remember was that the sauce had ginger ale in it. So, I called Cathy and Jeanie, and I even emailed my cousin, Pattie. Everyone remembered the dish but had no idea how Mom used to make it. Luckily, Denny remembered! Then, as I was at the grocery store buying ingredients, I ran into our long time next door neighbors, Frank and Claire. I told Claire what I was planning to make and she told me that she makes it too, pretty much the same way Mom used to make it. Perfect! So here it is. It's a piece of my childhood, and it's gift from Mom that I'm happy to share with you. It's perfect for a quick mid-week dinner because it's ready in minutes and it's also perfect to serve instead of roast beef or meatballs at your next holiday party. In a large pot, simply mix together the first 4 ingredients over medium heat. 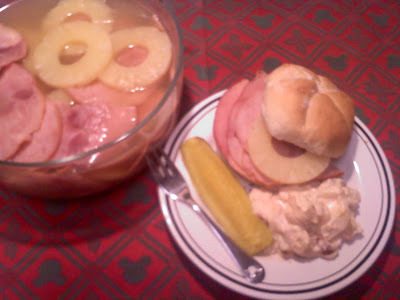 As it simmers, add pineapple and ham slices. Let it simmer for about 20 minutes, just long enough to heat the ham, and blend the flavors. Serve hot on fresh bakery rolls. -These amounts are just a guideline. I'm guessing Mom never measured anything. She just sort of threw everything into the pot, and everything is to taste. Do you like a lot of mustard? Add a lot of mustard. So forth. -It might seem like the final dish will be far too sweet, considering the brown sugar and juice and all, but the saltiness from the ham really balances everything. -Mom always sliced the ham by hand because the thicker slices hold up better as they sit in the sauce. Thinly sliced deli ham always becomes kind of wrinkly and not quite as hearty. -Another thing Mom always did was to float maraschino cherries in the pot with the ham and pineapples. It gives the sauce a lovely pink hue. -I like Canada Dry ginger ale the best, but clearly any brand will work perfectly. You can even substitute 7 Up. Whatever you have on hand will work. If I were using 7 Up, I'd probably add a little ground ginger. You can also substitute any kind of mustard if you don't have dry mustard, and you can use chunks instead of slices of pineapple. Mom always cut the slices into chunks anyway! However you make it, it'll always turn out great! -This makes quite a bit, which would be perfect for a party, but you can easily cut the amounts in half. -If you're cooking for a party, just throw everything into a crock pot to keep it hot, then place a basket of rolls next to it and have your guests serve themselves. -If you're planning to roast a holiday ham, you can use this exact recipe to glaze the ham before you put it in the oven and then pour on more glaze as it caramelizes.